Roy Moore Slams McConnell's "Slime Machine" [VIDEO] - Joe.My.God. The 30-second ad spot echoes President Trump’s calls to “drain the swamp” in Washington and attacks the Senate majority leader for “spending millions to attack” Moore, an apparent reference to a Politico report that the Kentucky Republican’s super PAC is gearing up to spend as much as $8 million to back Sen. Luther Strange’s (R-Ala.) campaign. “They lied about repealing ObamaCare. 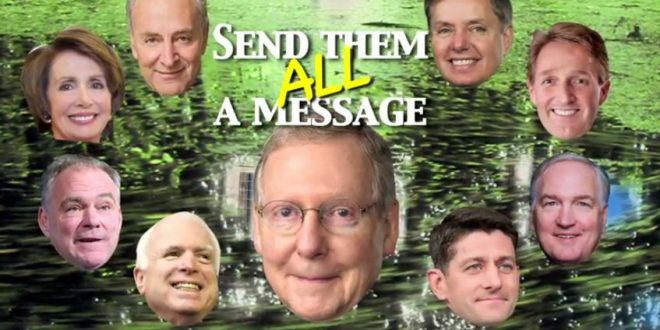 Now, Mitch McConnell’s D.C. slime machine is spending millions spreading lies about Roy Moore, bearing false witness,” the ad’s narrator says. “Why? We know why. We all know why,” the ad continues. “Roy Moore is honest and Roy Moore is his own man. And Roy Moore fears God, stands for the Constitution, fights for what is right and believes what we believe.